Hi everyone. 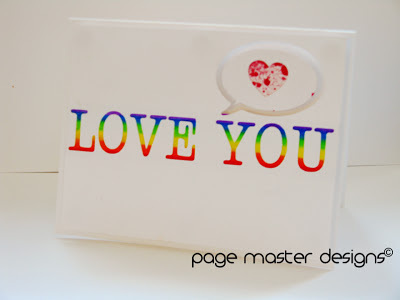 I am back today with another negative space card for this month's Trends Challenge at Scrpamaster's Paradise. This was created using letter dies. SP & Co sells two different alphabet dies and I love BOTH of them. I used this one here Timeless Typewriter any alphabet die would work or you can use your electronic die cutting machine to get the same effect. I started by cutting a piece of paper down to 4 1/8 x 5 3/8 and making my card 4.25x5.50, I then die cut the speech bubble in my Silhouette software out of the 4. 1/8x5 3/8 paper. Then line up your dies and die cut them. Don't forget to reverse them. 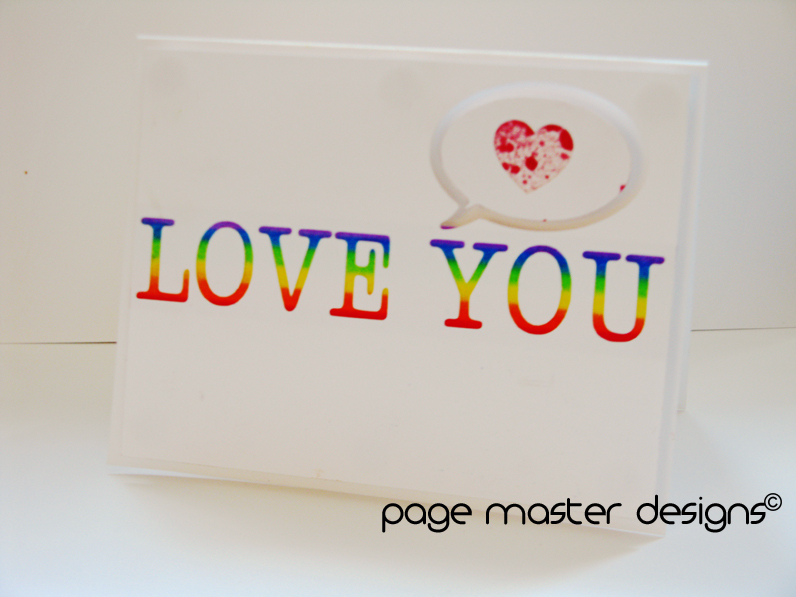 I took a scrap piece of paper and laid my die cut paper over it so that I could get the size I would need for the rainbow strip. I put tick marks above and below the "i love you" and then I colored a rainbow on the strip with colored pencils. I then attached it to the back of the die cut paper. I added lots of pop dots to the back of it.. I spritzed the little heart with some Tattered Angels spritz and taped it to the back of the speech bubble and then pop dotted all of that. It was a very fast, very fun card to make. I hope you will join us in the Trends Challenge and show us what you do with negative space! There is a $25 Gift Certificate to the SP & Co store up for grabs for one lucky entrant!